(CNN) -- Ferrari are weighing up whether to take their fight with the FIA to the civil law courts after failing to acquire an injunction against next year's controversial F1 rule regulations. Ferrari are among the teams that have threatened to withdraw from the sport. 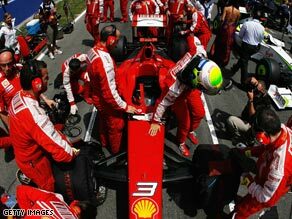 The Tribunal de Grande Justice in Paris recognized Ferrari have a right of veto with regard to new rules drawn up by the FIA. However, they ruled such a veto should have been exercized at the World Council meetings of March 17 and April 29 when FIA president Max Mosley and the FIA unilaterally decided to impose a budget cap from next season. As the dispute is a contractual matter, the tribunal also made it clear a decision was beyond their remit, and instead was one for the civil courts. "No competitor should place their interests above those of the sport in which they compete," an angry Mosley told Press Association Sport after the tribunal's decision. "The FIA, the teams and our commercial partners will now continue to work to ensure the well-being of Formula One into 2010 and beyond." The latest meeting of the Formula One Teams' Association is due to take place in Monaco on Friday when they will likely determine what approach should be taken. Ferrari, though, have reiterated their previous stance that if no agreement can be reached between the teams and the FIA, then they will end their 60-year participation in F1. A Ferrari statement read: "While continuing to evaluate whether or not to continue with this legal action already under way, Ferrari confirms its commitment to work in conjunction with the FIA to ensure Formula One is a series where the rules are the same for everyone and which benefits from stability in the regulations, while continuing the work of the past few months in moving forward methodically and gradually towards reducing costs. "If it is not possible for all parties to reach agreement, then in line with the decision of the main board, taken on May 12, Ferrari will not enter its cars in a competition that would see a watering down of the characteristics that have endowed Formula One with the status of the most important motor sport series in the world."